We were told to keep an eye out for the resident seals, whales and dolphins. Gazing out onto the Pacific while stretching out in the warm sunshine was one of the highlights of my trip— a true moment of serenity. Road-tripping through California had been on our travel bucket list for about a decade, but this year we finally decided to pack up our two small children and make it a reality. We mapped out a route that would take us from Los Angeles over to Palm Springs (2 hours), then up along the West Coast to the beautiful Pismo Beach area (5 hours with a stop in Santa Barbara), situated halfway between LA and San Francisco, before returning back to Los Angeles (2 hours). We took ten days to enjoy and soak up the sunshine. As parents of of a six-year-old and a baby, we chose extra nights at the luxe resorts to get a little pampering ourselves. We were a little apprehensive as this was our 8-month-old baby’s first experience flying, but, thankfully, the ten-hour flight from London to Los Angeles passed with relative ease. To make getting through the airport less stressful, we hired the bulky kid’s equipment at our destination through Road Trip Babies. They met us at LAX with two car seats and a stroller, which definitely lightened the load. 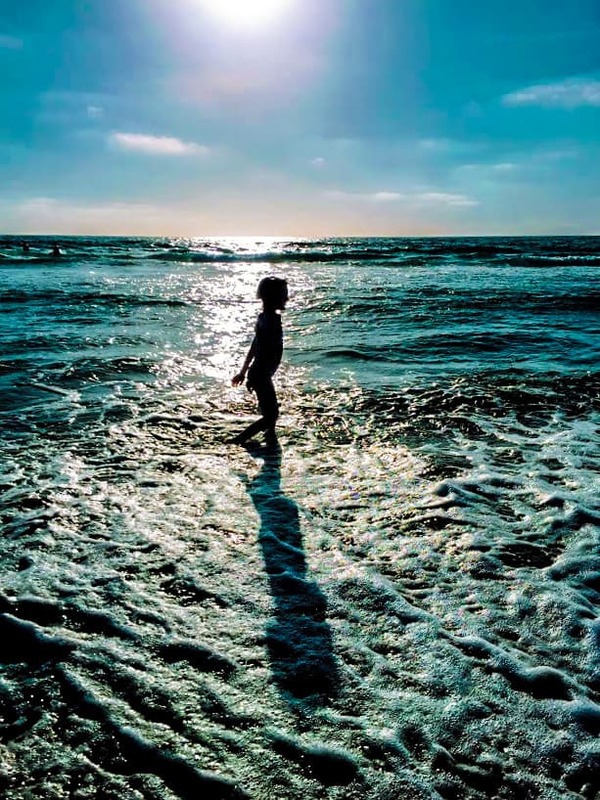 With our baby and our six-year-old daughter safely strapped into the backseat, we headed over to Hermosa Beach, an easy drive from LAX, with a palm tree lined golden beach, and crashing waves attracting the local surfers. Acclimating to California time on the first day with a swim in Hermosa Beach. We spent our first night at the wonderfully relaxed Beach House Hotel where we had a family room overlooking the beach, offering a spectacular view of the sun setting over the Pacific Ocean. 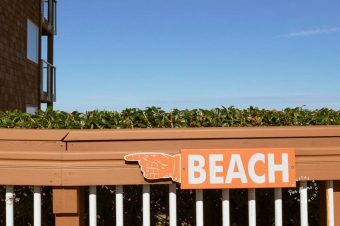 The hotel is a popular choice for families as there are lots of outdoor activities on your doorstep – from hiring bikes to ride along the promenade to beach volleyball and paddle boarding. 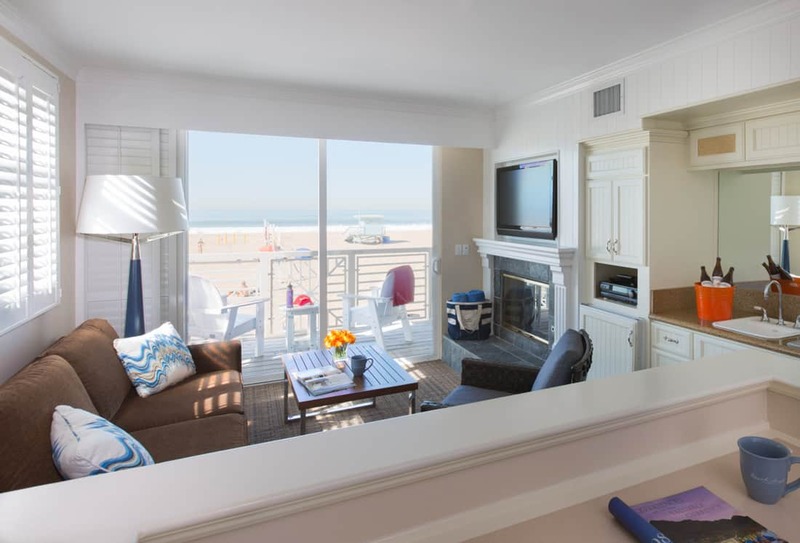 The Beach House is close to LAX and its spacious suites on the beach make it perfect for families. Photo courtesy of hotel. The hotel can also organize children’s surf lessons with one of the leading instructors in LA. Our Hermosa Beach visit was the perfect introduction into the laid back, healthy Californian way of life and as we were just there for the night, was sadly all too brief. The next day we headed into central LA, as my eldest daughter and I had booked onto the Warner Bros. Studio Tour. 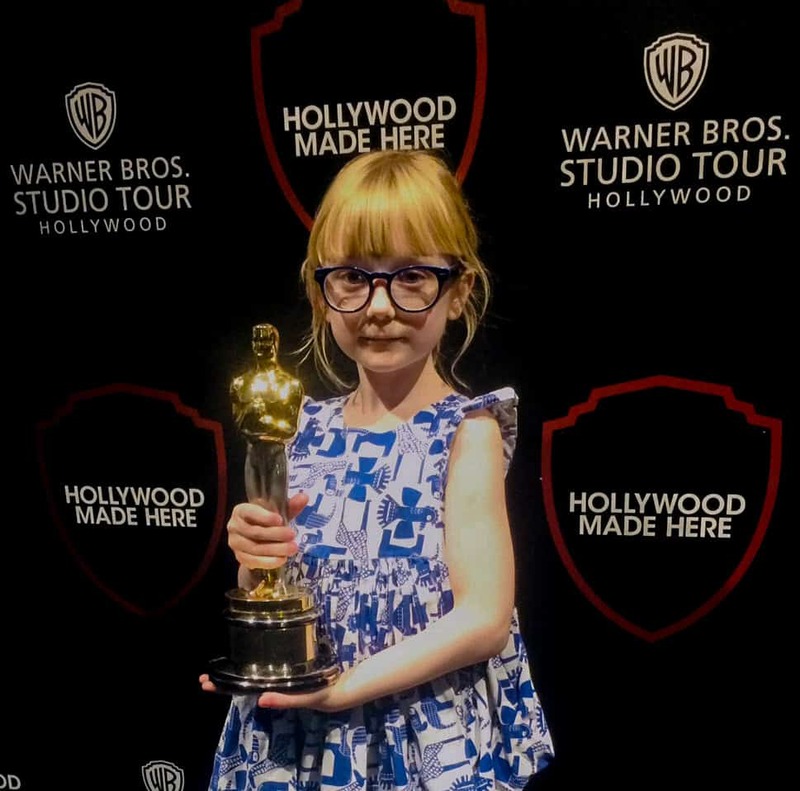 She is already quite a film-buff, and she loved the whole experience — especially trying on the Hogwarts sorting hat and being photographed holding an authentic Oscar statuette. Yes, that’s a real Oscar! I preferred exploring the back-lots and seeing the crew and actors whizz past on buggies. It was one of those great activities that managed to engage both children and parents and we both came away feeling like we’d learned lots about the behind-the-scenes happenings on a movie set. That night, we stayed at the Loews Hollywood Hotel, convenient to the studio tours. The iconic Hollywood sign is within perfect sight from the hotel’s rooftop pool. Venturing out of the building, you are only a matter of steps from the Hollywood Walk of Fame – with all the weird and wonderful street theatre that accompanies it. We had stayed at the Loews Vanderbilt previously in Nashville, so knew first hand that they are great at looking after families. Thankfully, Loews Hollywood didn’t disappoint – we were given a room with fantastic views across the city which was completely set up for the kids upon arrival, with a cot and children’s welcome packs waiting for them. They were also given a special cup to get free water, milk and juice refills in the café. The next morning we hit the highway again, driving just under two hours through the Joshua Tree-lined desert to Palm Springs. The town is a mecca for Mid-century modern design enthusiasts (me! ), with almost every building in the town influenced by this local style. We took a guided tour of the town’s architectural highlights with The Mod Squad who allow kids, provided that you bring your own car seats. 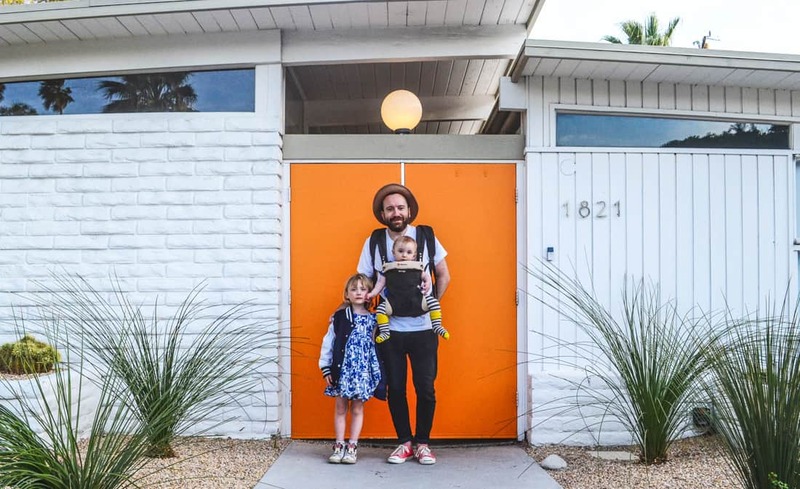 There are many family friendly rentals in Palm Springs like ours with the Desert Collective. Truly to experience the Mid-century lifestyle, you must sleep in a fabulous Palm Springs home. We spent our first night at The Amado, an impeccably restored Mid-century gem, with a handful of suites surrounding a tranquil swimming pool, overlooked by the San Jacinto Mountains. I loved how the owner, Jaime Kowal, had restored the building with low-key but elegant furniture. We stayed in a one-bedroom apartment with a sofa bed in the front room for our eldest, but there is also a two-bedroom apartment to rent, or the entire complex can be hired for larger family gatherings. The Amado is within walking distance of Downtown Palm Springs, which is home to Villagefest, their Thursday evening street market. Luckily, our visit coincided with this, so we strolled there and enjoyed shopping for trinkets. Being out with the kids in the evening is one of the highlights of our family vacations – that feeling of being liberated from the daily routine, even if it’s just for a few weeks, is something we all really valued on this trip. In keeping with the Mid-century theme, our next stop was the Ace Hotel & Swim Club, a renovated former motel and Denny’s diner that has successfully transformed into a hipster destination. 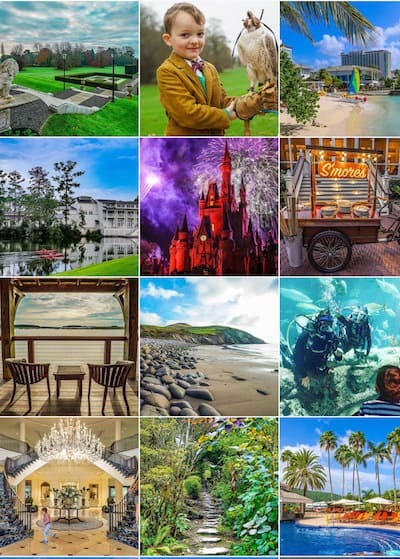 The overall vibe of this hotel is mellow and friendly, and there were plenty of children in the swimming pool enjoying the Instagram-ready floats. Meals at The Ace are either taken at the diner-style restaurant or on the pretty pool terrace, lit by strings of bulbs in the evening. The menu is a relaxed combination of trendy comfort dishes and Californian health food. I opted for smashed avocado on toast – a simple dish prepared to perfection, which I have been attempting to recreate since we’ve returned! 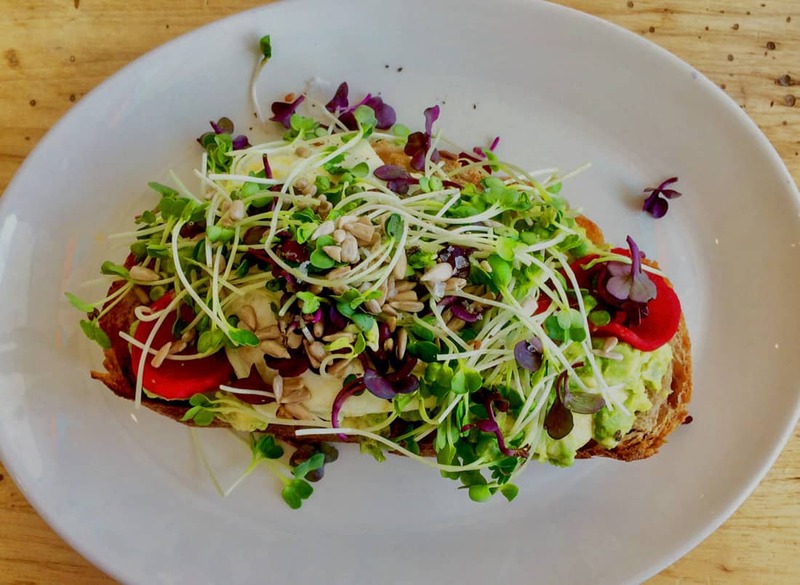 Avocado toast from The Ace Hotel is worth its hype. The Ace is also just across the street from Kreem, a recently opened artisan ice cream and coffee shop, serving up the tastiest ice cream in Palm Springs. While I marveled at Palm Spring’s architecture, there was plenty to keep the rest of the family entertained. We enjoyed horse trekking along the base of the breath-taking mountains to taking a ride on the world’s largest rotating aerial tramway. 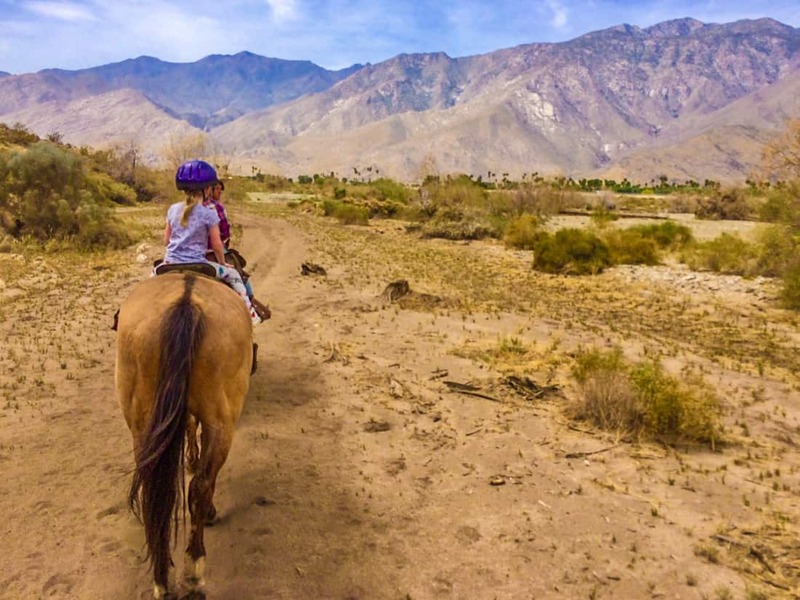 Trails for families in Palm Springs. Trying one of the famous date-shakes at Shields Date Garden and visiting the ginormous Cabazon dinosaurs – a kitsch roadside attraction where children can climb into T. Rex’s mouth. 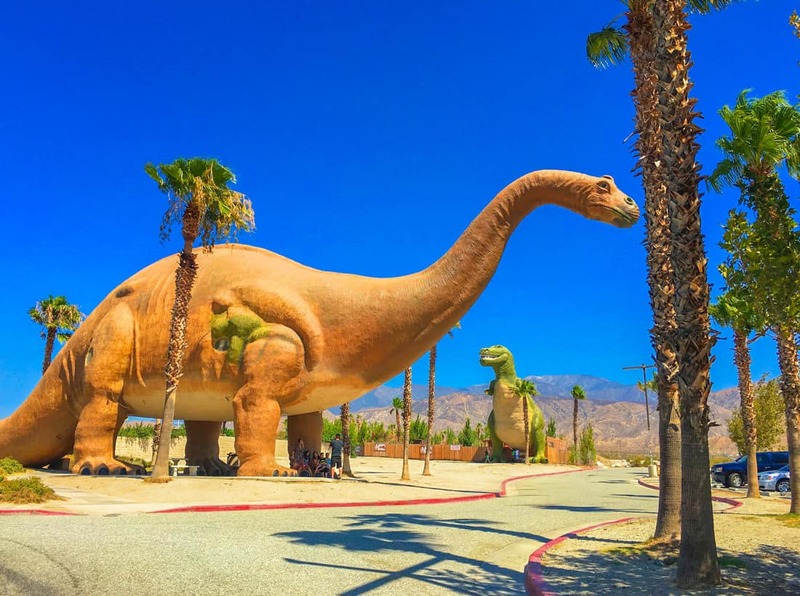 A must stop, the Cabazon Dinosaurs, just outside of Palm Springs. 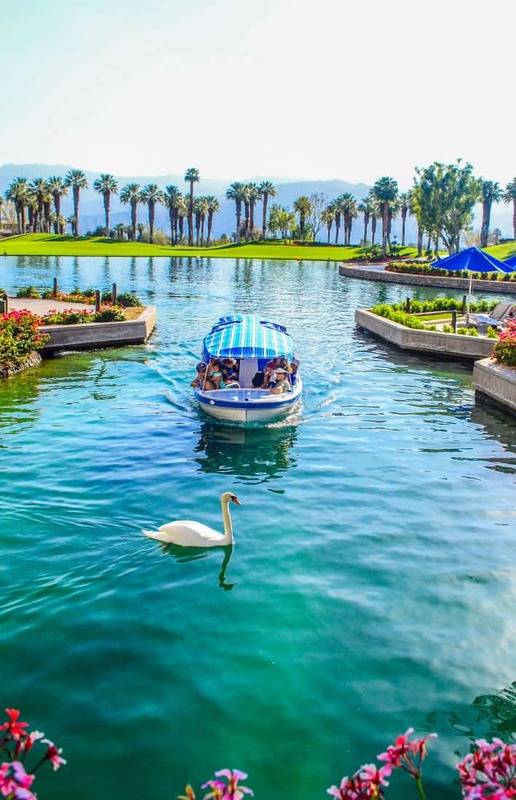 For our final few days in the Coachella Valley area, we headed over the JW Marriott Desert Springs Resort & Spa. 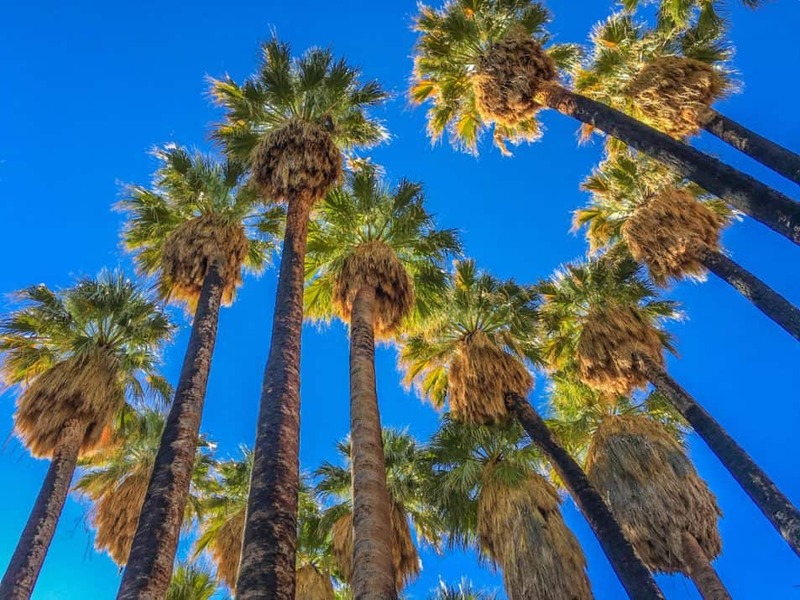 It’s situated 30 minutes outside of Downtown Palm Springs in Palm Desert, an area known for its palm tree-lined golf courses and resorts. 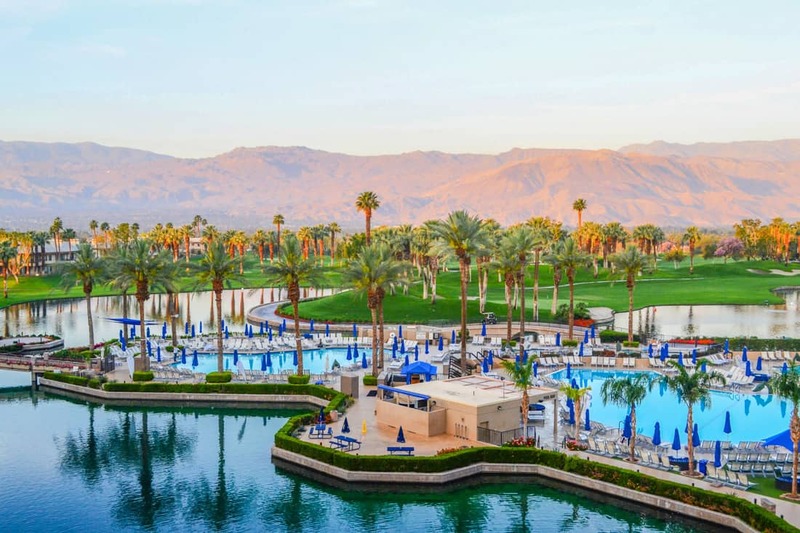 The JW Marriott’s water areas are vast and contrasting to the desert environment. Coming from Europe where our resorts are somewhat tiny by comparison, I was awed by the scale of the JW Marriott initially, and it took me about a day to find my bearings. Once we had settled in, I did increasingly grow to appreciate the benefits of staying in this style of resort. Although it might not have felt as intrepid as some of our other hotel choices, staying somewhere so geared up for families made our time here very easy and relaxed. The children had their choice of five different pools to play in and lots of kids to make friends with, while my husband and I had a good choice of fitness classes onsite. The JW Marriott water shuttle. There were six different restaurant choices for meals. Our favorite was the Italian-American Rockwood Grill that serves a great kid’s buffet. The terrace provides a ringside seat for the dramatic, fiery sunsets. In school holidays, the JW Marriott has a fun-packed activity schedule – including evening movies shown by the pool. Unfortunately we got the tail-end of the kid’s activities as we were slightly outside of the American school holidays, but there was still plenty to keep us occupied – from mini golf to feeding the flock of beautiful pink flamingos that live on in the resort lake. There is even a canal running through the lobby, where you can board a gondola that takes you on a little trip around the grounds. We came away from our stay at the JW Marriott feeling that it was an epic but very well considered resort, providing everything onsite that you could possibly need for a relaxed family vacation. Leaving Palm Springs, we headed up the coast, past LA and onto the scenic Pismo Beach area. 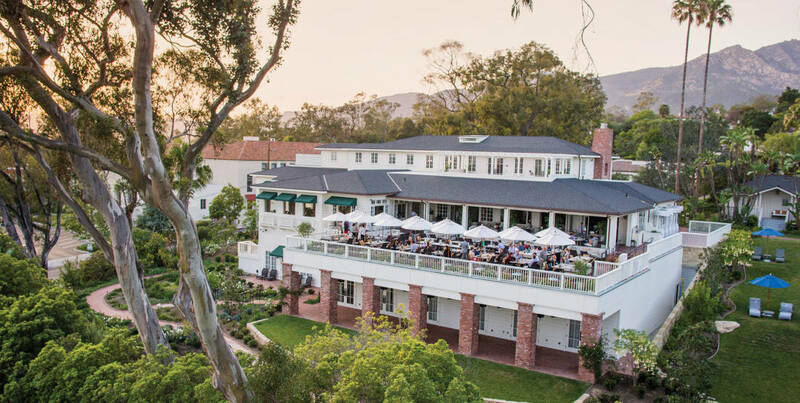 At five-hours, this was the longest car journey of our trip so we decided to break up the drive by stopping at the five-star Belmond El Encanto hotel in Santa Barbara. We stopped for a civilized meal and a massage at the Belmond to keep everyone happy on the drive. After a leisurely lunch on the terrace overlooking the city, I popped into the spa for a heavenly massage while Craig and the kids played outside on the lawn. We all got back into the car feeling far less cranky and decided to use well-planed pit-stops for family road trips in future. 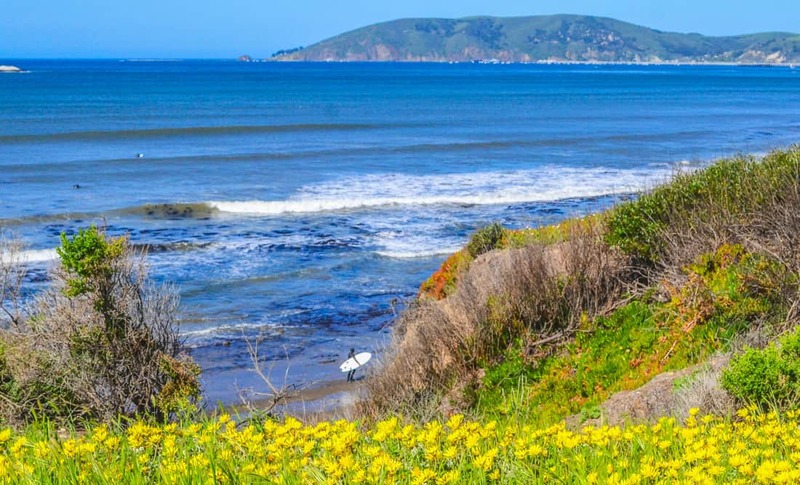 As we were nearing the end of our road trip, arriving at the Dolphin Bay Resort & Spa in Pismo Beach felt blissfully restorative. The hotel is surrounded by stunning natural beauty, with a rugged coastline for hikes, meadows filled with wild flowers and craggy rocks that are ideal for rock-pooling. It’s also a popular surfing destination and suits and boards can be hired from stores locally. Surfers near the Dolphin Bar Resort in Pismo Beach. Our room was so spacious it would have rivaled a decent-sized apartment, and was fully equipped with a kitchen and washing machine (we miraculously managed to leave the next day with suitcases filled with freshly washed clothes!). There was also a generous sized swimming pool and a good restaurant onsite with a kid’s menu and some tasty but healthy breakfast options. On Sunday mornings the hotel organizes a yoga session for guests on the cliff terrace overlooking the sea. Guests should keep an eye out for the resident seals, whales and dolphins. Gazing out onto the Pacific while stretching out in the warm sunshine was one of the highlights of my trip— a true moment of serenity. The next day we were on the road again, headed back to LA to conclude our trip in style by booking into the five-star Four Seasons Beverly Wilshire hotel by Rodeo Drive. 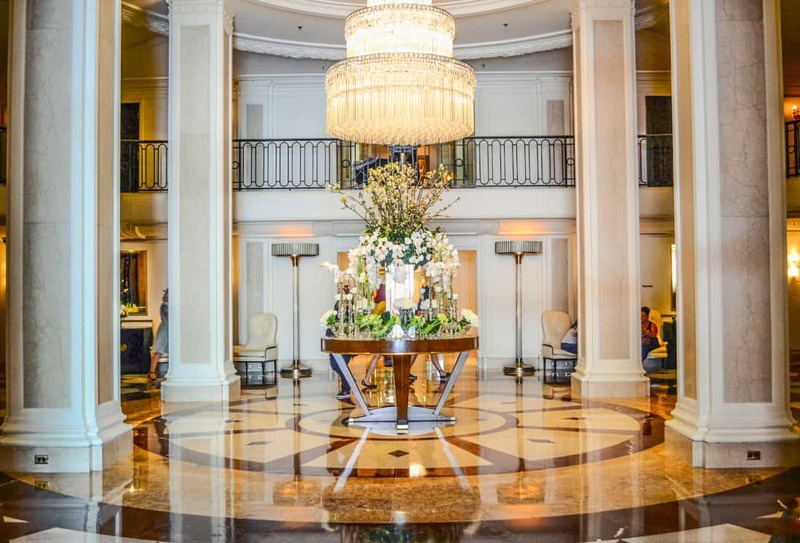 The lobby of the Four Seasons Beverly Hills Wilshire. I’m sure we’ve all experienced that scenario when you take small children into a very high-end environment, and the heart sinks as you realize that the expectations of their behavior is well beyond their capabilities. Well, I was delighted to find this was absolutely not the case at the Beverly Wilshire – in fact they couldn’t have made us feel more welcome! The staff all learned our children’s names and stopped to chat. When we arrived in our suite, with sweeping views across LA, the room was set up with a welcome toy, baby toiletries, nappies and a nappy bin, children’s bathrobes and princess bed sheets. Our eldest couldn’t wait to get changed and rush down to the gorgeous Mediterranean rooftop pool, where she spent the afternoon splashing about and chatting with the other children. Sipping iced water, we sheltered from the sun under the parasols and gradually came to the conclusion that this hotel was just too wonderful to leave – so we cancelled our activities for the next few days and enjoyed splitting our time between our fantastic suite and the pool, which has a café serving up lobster rolls that are dangerously addictive. Our last few days at the Beverly Wilshire were a blissful conclusion to our road trip through the Sunshine State. Having visited the beach, the desert and the city, we left California invigorated – taking a little of that famous sunshine back home with us. Zoey Goto is a London based journalist and author, writing for international publications about fashion, lifestyle and travel. 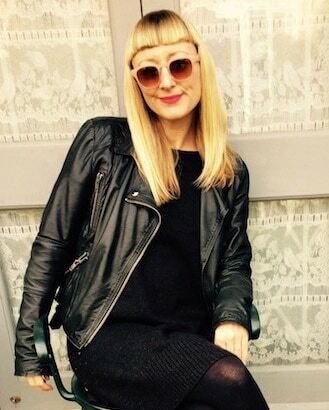 She writes for titles including GQ, GQ Style, Numero and Elle magazine and is also author of the book Elvis Style: From Zoot Suits to Jumpsuits and has that the unique privilege of sleeping in Elvis’ teenage bedroom. 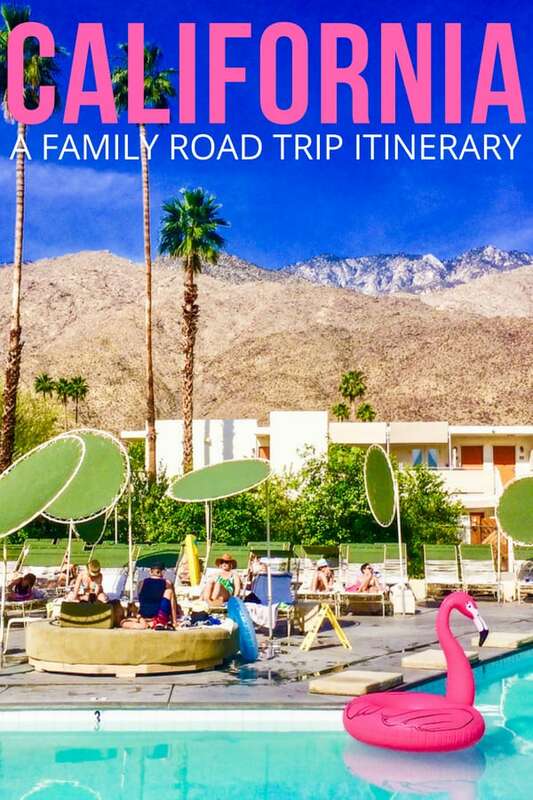 In the past year, she has also driven across two different American states, writing travel features about road-tripping with her small children. This post has been sponsored by BONZAH. 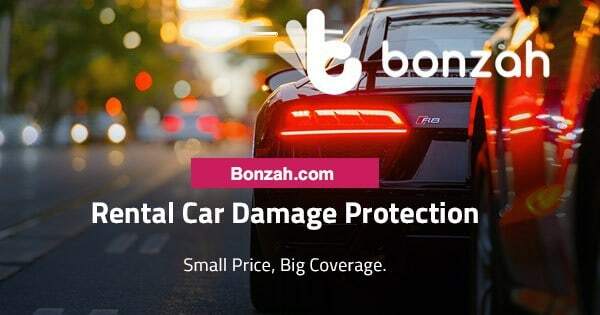 Bonzah offers you more affordable and comprehensive rental car insurance for that epic road trip. Our last California road trip with kids involved a whole lot of vomit, so this seems a much more appealing way to do it! 🙂 Love that Four Seasons lobby!